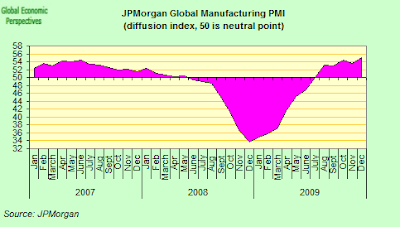 Global manufacturing industry ended 2009 on what seems to be a fairly positive footing, with the JPMorgan Global Manufacturing PMI posting a comfortable 55.0 in December, up from 53.7 in November, significantly above that critical 50 growth/contraction dividing line. 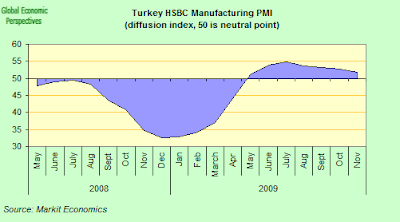 December’s was the highest reading for 44 months, and the headline Global PMI has now remained in expansion territory for each of the past six months. So this is not a fluke, and growth is being sustained, even if it is not evenly distributed, and is far from being that much hoped for “V” recovery. 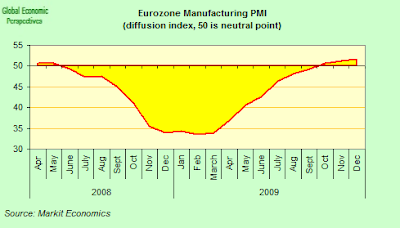 But of course, what happens to all of this as the stimulus is gradually withdrawn? One thing is clear at the present time, and that is that economic growth in Asia is powering ahead at a faster pace than in other regions – and is being led by China and India. 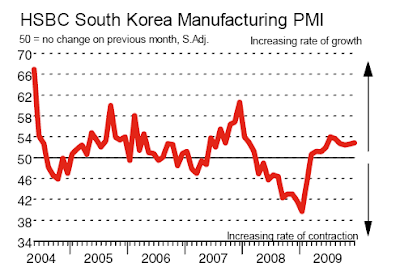 The PMI reports for China, South Korea, Taiwan and India all suggest the presence of a widespread recovery. Japan improved for the first month in four, although Japanese exports do seem very China dependent. Australia was the outlier in Asia, with conditions deteriorating from November and the PMI falling back to from 51.2 last month to the present 48.5. 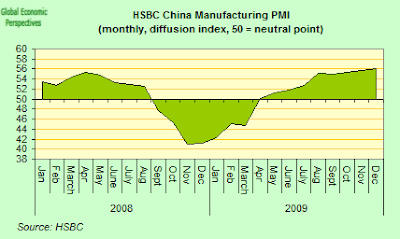 The China HSBC Manufacturing PMI rose to 56.1 in December, up from 55.7 a month earlier â€“ the second fastest rise yet recorded by the survey, which dates back to 2004. 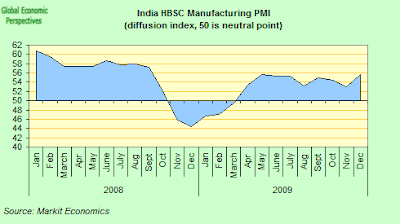 The HSBC PMI data also signalled that prices charged by Chinese manufacturers were rising at the fastest rate since July 2008, bouyed by rising raw material costs as well as strong demand. Higher new orders placed pressure on firmsâ€™ capacity, leading to a further rise in backlogs of work during December. The rate of growth of outstanding business was robust and the strongest in three years. If the US is no longer the global consumer of the last resort, France is certainly in the process of becoming the European one. 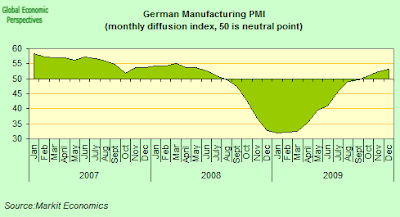 As far as I can see, you can read four things here into this December German reading: i)the situation in German manufacturing has improved since May; ii) but not very much (since 52.7 is not a very high absolute reading); iii) he final reading came in slightly v lower than the flash – that could indicate deceleration as the month went one, the good profile is having a higher final reading than the flash one; iv) the improvement came from a slowing down in job shedding (which may suggest increased optimism for the future, retaining staff etc), but not from an increase in output.Conclusion, German manufacturing continues to move forward, but the road is a lot longer and a lot harder than many were expecting. There is no sharp rebound here, nor are we likely to see one. Italy continued to more or less move sideways. 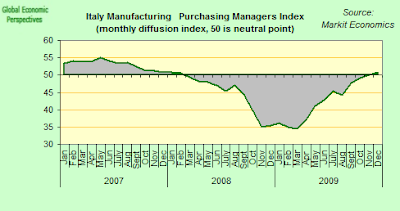 At 50.8, up from 50.1 in November, the seasonally adjusted Markit/ADACI Purchasing Managersâ€™ Index only served to underline the fragility of the recovery in Italy, and how easily Italian manufacturing could fall back into contraction. On the other hand Italian manufacturers recorded a solid rise in new export orders during December. The increase in new business from abroad was faster than that recorded for overall new orders, suggesting that demand growth was stronger across export markets than in Italy. Business conditions in Russiaâ€™s manufacturing sector deteriorated yet again in December, suggesting that domestic inflation and the rise in the ruble was continuing to take its toll on manufacturing competitiveness. Output was only marginally higher than in November, and new orders fell for the second month running. 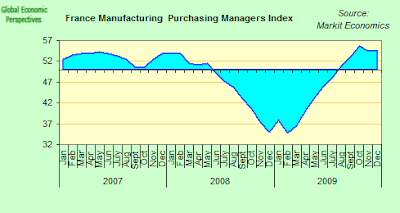 Meanwhile, manufacturers continued to shed staff and cut inventories. 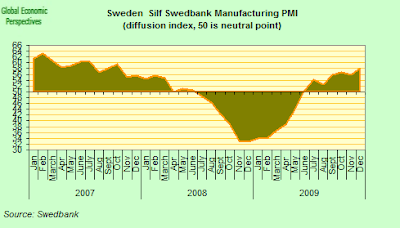 Input and output prices both rose on the month but, in both cases, the rates of inflation remained historically weak. 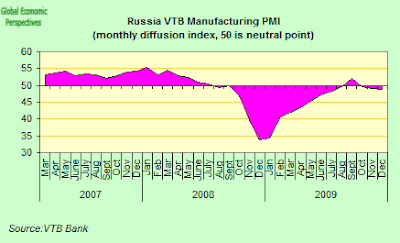 The headline seasonally adjusted Russian Manufacturing PMI posted a second consecutive reading below the 50.0 no-change mark in December, indicating an overall deterioration in manufacturing business conditions. The index declined to 48.8, from 49.1, its lowest level since July. Contributing to the downward movement in the index were slightly steeper falls in new orders and stocks of purchases, and a slower lengthening of suppliersâ€™ delivery times. In the Americas, both Brazil and the United States showed strong growth – in the US case the reading was a four year high. 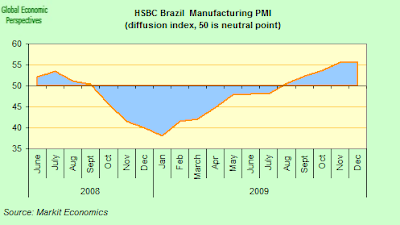 The Brazilian manufacturing sector continued to expand at a robust pace, and the seasonally adjusted Brazil Manufacturing PMI hit 55.8 in December, up from 55.5 in November – its highest level since November 2007. Output rose for the sixth time in seven months, and at the fastest rate since October 2007. Unfinished business and employment both increased during the latest survey period, pointing to the existence of capacity pressures in Brazilâ€™s manufacturing industry. Staffing numbers expanded at a robust rate that was the fastest for seventeen months. The U.S. manufacturing sector expanded in December for the fifth straight month, according to the Institute for Supply Management report. 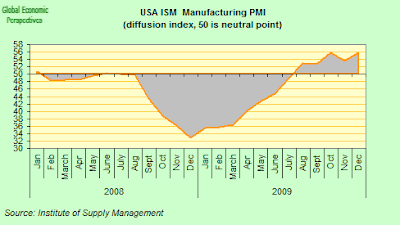 The ISM manufacturing index rose to 55.9% from 53.6% in November. It was the highest since April 2006. In December, nine of 18 industrial sectors were growing, led by apparel, petroleum, electronics and machinery. Manufacturing is benefiting from the need to restock inventories, according to Norbert Ore, chairman of the ISM’s survey committee. “Overall, the recovery in manufacturing is continuing, but there are still some industries mired in the downturn as evidenced by the seven industries still in decline,” Ore said. Construction materials, chemicals and plastics are declining. The new orders index rose to 65.5% in December from 60.3% in November. It was the highest since December 2004. The employment index rose to 52% from 50.8% in November. 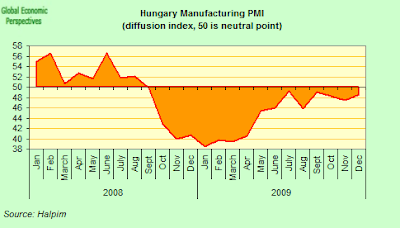 The production index rose to 61.8% from 59.9% in November. The supplier delivery index rose to 56.6% from 55.7%.